A total of 18 patients with severe OSAS and 13 controls were included in the study. 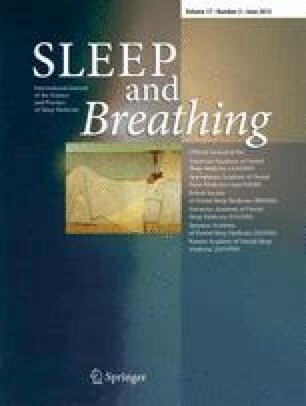 Inclusion criteria for OSAS patients were: snoring and apnea–hypopnea index (AHI) of >30 in full polysomnography, no previous treatment for OSAS, non-smoking status, and a medical history of being free of comorbidities known to increase oxidative stress. Controls were recruited among subjects assessed for snoring in the Sleep Laboratory Department if they had AHI<5. At baseline, patients were evaluated by the Epworth Sleepiness Scale and underwent spirometry, echocardiography, and full polysomnographic study. Blood samples were collected for evaluation of oxidative stress biomarkers [protein carbonyls, reduced (GSH) and oxidized (GSSG) glutathione, 8-isoprostane, thiobarbituric acid-reactive substances (TBARS), catalase activity, Cu–Zn superoxide dysmutase (SOD), total antioxidant capacity (TAC)] before and on the morning following polysomnography. The overnight (morning–night) change (%) of GSH/GSSG ratio and GSH was significantly different between OSAS and controls (p = 0.03 and p = 0.048, respectively). Plasma protein carbonyls, erythrocyte catalase activity, 8-isoprostane, SOD, TBARS, and TAC plasma values were not different between OSAS and controls (p > 0.05). No significant correlation was found between changes in the levels of biomarkers and AHI, arousal, or desaturation index. Part of the results which are included in the present manuscript has been presented in the form of an abstract at the ERS Berlin 2008 Congress. The online version of this article (doi: 10.1007/s11325-012-0718-y) contains supplementary material, which is available to authorized users.